The governorship candidate of the Alliance for Democracy (AD), Chief Olusola Oke, has denied being arrested, saying his rumoured arrest was devised by his detractors to score cheap political goals. Oke accused the PDP of being the sponsor of the rumour, saying that the campaign of calumny peddled against him only made him more popular. The governorship candidate who spoke through his media aide, Mr. Kolawole Olabisi, said he was not arrested at any time by any law enforcement agent, adding that he has since his formal declaration been moving round all parts of the state to solicit for support of the masses. He said both the APC and the PDP in the state are intimidated by his rising popularity, hence their resolve to blackmail and other mischievous acts aimed at soiling his reputation. 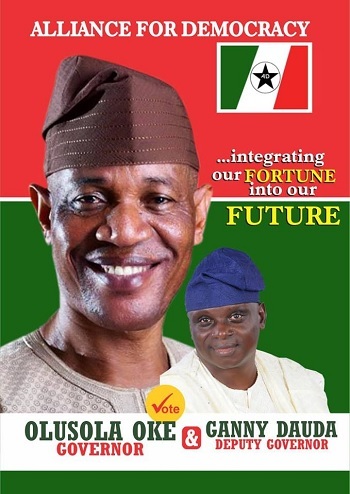 “Oke is a responsible citizen of Nigeria and he has been moving round the state since he launched his campaign. He left Akure this morning for Ilaje Local Government and he had met with different people there. “By the way, why would Oke be arrested when he did not commit any offence? He did not carry arms, neither did he carry ammunition. The rumour was the handiwork of his detractors whose aim was to soil the good reputation he has built over the years,” he added. “The PDP resolved to peddle the rumour of Oke’s arrest and use the social media to circulate the rumour as a result of the court of the indefinite adjournment given by the Court of Appeal in Abuja. Olabisi noted that the rumour was baseless and have no iota of truth, and therefore enjoined members of the public, especially residents of the state to discountenance it in its entirety. Meanwhile, the Aketi Media Group of the Oluwarotimi Akeredolu Campaign Platform has commended the military for its professionalism and vigilance in the arrest of gunmen allegedly on the campaign trail of Oke. The men were allegedly accosted by military men at a checkpoint in Okitipupa where pump action guns, machetes, and a digital camera were found on them. The men, who first claimed to be journalists but they had no means of identification. They merely used the camera to disguise as journalists before the military men discovered the guns inside their vehicle. Director of Communications of the Akeredolu Campaign Platform, Mr Soji Alakuro, berated Oke for allegedly harbouring armed thugs to terrorise innocent citizens in order to precipitate violence before, during and after the election. “Oke is a desperate politician seeking power at all costs by jumping from several political parties before berthing in AD to clinch the governorship ticket. “It is baffling that after that political flirtation, he is not yet content with the civil manner of seeking power, but has gone ahead to recruit thugs to unleash violence on the citizens while seeking political power at all costs. The governorship candidate of Alliance for Democracy, AD, Mr. Olusola Oke has reportedly been arrested at Okitipupa area of Ondo State. His arrest was revealed by a tweet @SaharaReporter. 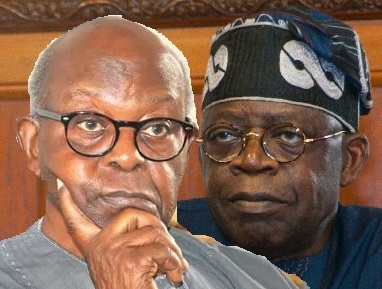 The APC National Leader, Senator Bola Tinubu, is said to be rooting for Chief Olusola Oke, the candidate of the AD, following the edging out of his preferred candidate in the party primary, Chief Segun Abraham. Oke had, like Abraham, lost out in the same exercise but opted for the Action Alliance (AA) before he moved to the AD allegedly on the directive of Tinubu. According to ThisDay Newspaper, Tinubu has sealed a power sharing deal with Oke. 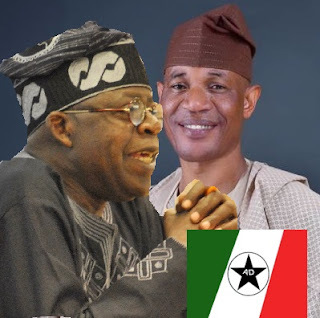 Among the terms of the deal is that for bankrolling Oke, the Osun State Governor, Mr. Rauf Aregbesola, would nominate the secretary to the state government. Among other things, the power sharing deal involves the distribution of cabinet slots and other strategic positions if Oke wins. But there is a caveat: the APC leaders must mobilise enough resources and voters to first ensure the victory of the AD candidate. 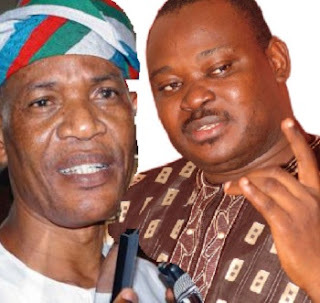 Although details of the power sharing deal were still kept secret, a source close to the deal disclosed that Oke had agreed to concede some positions to the APC national leader and Aregbesola. They include: Secretary to the State Government (SSG), chairmanship of the Ondo State Oil Producing Areas Development Commission (OSOPADEC), Commissioners for Finance, Works, Local Government and Chieftaincy Affairs, Health and headship of the Ondo State Board of Internal Revenue. Others include six caretaker committee chairmanship positions, that is, two per senatorial district as well as four special advisers. The source said: “You know that the circumstances that led us to the AD are very peculiar. At first, we wanted Action Alliance but when the national leader suggested that we need to test the ground with AD in lieu of the zone’s interest ahead of 2016, we had no choice than accept the AD proposal. Meanwhile, the leadership of the AD has approved a waiver to enable Oke fly the party’s flag in the election. In a statement by its National Chairman, Chief Joseph Avazi, yesterday, the party said that it had rectified the waiver for Oke at its National Executive Committee meeting in Abuja. He said that the AD NEC meeting was monitored by INEC officials, Mr. Ifaladu Saadu and Mrs. Bola Adewon. "I don’t see him as such. It’s a bit intricate, in the sense that if Tinubu had behaved in the way expected by Yoruba people, the politics of Nigeria wouldn’t be as it is now." "What I mean is this. Alliance for Democracy (AD) came in and through the party, Tinubu became governor. However, when he was well seated comfortably as governor, he rubbished the leaders of the party and in any case, brought the AD into problem, until the party more or less, collapsed. Then, he was looking for alliances from various parties until they formed the Action Congress of Nigeria (ACN). From that, they jumped to APC." "Tinubu was, more or less, promoting self-interest as opposed to the interest of the Yoruba people. If he had been consistent in promoting the interest of the Yoruba people, what is happening to him today would not happen because AD would have become a very formidable, strong political party. Of course, he was not alone. With the other governors elected in 1999, they all connived and brought AD to an end. So, that is it." "But Tinubu could not say that he was not warned about allying with the Fulani. He was warned. Those who were, at that time, sounding notes of warning about Fulani coming into power." 'Really and truly, Tinubu should not be rubbished because he, Buhari and others worked for the success of APC. So, for him to be sidelined and ignored in the affairs of government and administration is unfair." "What ought to be done is that Tinubu should be treated decently because he was more or less the champion of the politicians who brought Buhari to power. He shouldn’t be ignored or maltreated or rubbished. That is not to say Tinubu is a holy man. He has his own weaknesses, no doubt about that. At the same time, he has worked for the party and should benefit from what goes on in the party. But for him to be neglected or relegated to the background, I think it is improper." 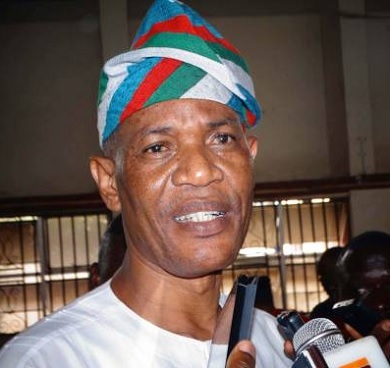 The National Executive Committee (NEC) of the Alliance for Democracy (AD), on Friday, rejected the candidature of Chief Olusola Oke for the forthcoming governorship election in Ondo State. The NEC, which held an emergency meeting in Akure, the state capital, condemned the withdrawal of the party’s candidate, Akin Olowookere, to pave the way for Oke’s candidature. The meeting passed a vote of no confidence on the national chairman of the party, Chief Joseph Avazi; national secretary; Akin Fasogbon; national auditor, Ayodele Ismail and the West Zonal chairman, Chief Tayo Onayemi, for not following the due process before adopting Oke as the party’s candidate. The NEC claimed that the national chairman and the three others unilaterally adopted Oke as the party’s candidate, contrary to the provision of the party’s constitution. Speaking during the meeting, the Deputy National Chairman (North), Mallam Musa Loyi, alleged that the national chairman had not called NEC meeting since he was elected into the position in December 2015. He also accused Avazi of denying the party the opportunity to take part in the just-concluded governorship election in Edo State by failing to endorse and submit to the Independent National Electoral Commission (INEC), the name of the candidate of the party, Ibrahim Garuba. A communique issued at the end of the meeting, read by Ibrahim Abdullah and supported by all the 44 members in attendance, read: “This meeting condemns in its entirety, all actions of the four officers in the emergence of Chief Olusola Oke as the flagbearer of the party in Ondo State. The meeting stated that failure to comply with its directive would lead to employing the constitution of the party in settling the impending crisis but said it was open to negotiation if the due process was fulfilled. Reacting to the development, the media aide to Chief Oke, Rotimi Ogunleye, said there was no official reaction to all the allegations. He said the party’s executive in the state should be in the best position to react to the allegations. Oke defected to AD after losing the All Progressives Congress (APC) ticket to Rotimi Akeredolu (SAN) in the September 3 primary of the party.